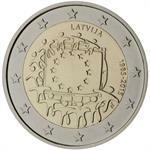 Home > arts & sciences > cultural heritage & artifacts > 2016 Lithuania €2 Coin Issue "Baltic Culture"
2016 Lithuania €2 Coin Issue "Baltic Culture"
The reverse features one of the most characteristic symbols of the Baltic culture, namely a piece of amber in the shape of a disc and decorated in the fashion of a cross. 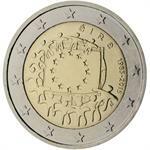 The coin’s outer ring bears the 12 stars of the European flag. 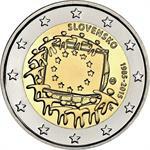 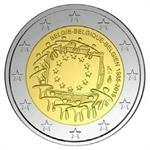 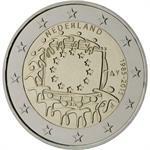 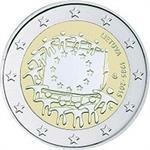 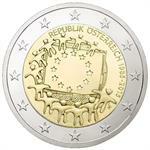 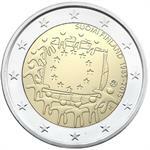 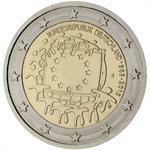 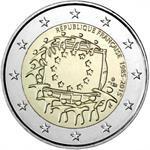 The commemorative coin's obverse is identical to that of ordinary €2 circulation coins. 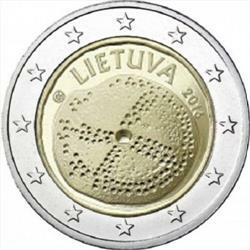 The edge lettering is the same as on the regular €2 circulation coins issued by Lithuania: „LAISVĖ * VIENYBĖ * GEROVĖ“ (FREEDOM * UNITY* WELL-BEING). 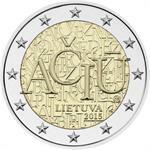 2015 Lithuania €2 Coin Issue "Lithuanian Language"